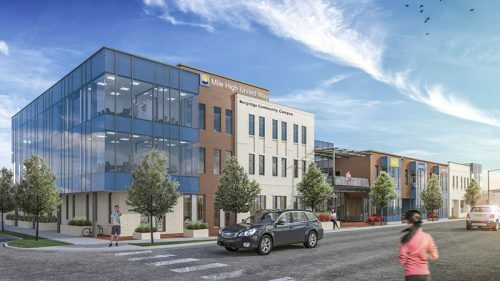 The design/build team of PCL Construction and Davis Partnership Architects recently started construction on the Mile High United Way (MHUW) new headquarters facility. 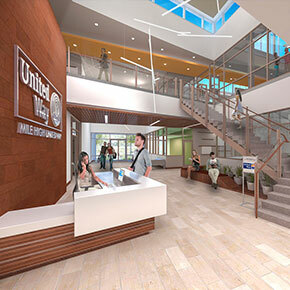 The relocation of the Mile High United Way to their new home is a catalyst for new and continued growth for the Curtis Park and the Five Points district. Mile High United Way engaged PCL and Davis Partnership in 2012 to study their space requirements and to assess whether their existing building could serve their long-term needs. After an in-depth study, the decision was made to build a new 63,000 sf headquarters facility that would provide the flexibility and expansion space they desperately needed. The PCL and Davis Partnership team assisted the organization as they considered nearly twenty potential sites for the new building. The chosen site lies in an historic district known as Curtis Park, just north of downtown Denver. The three-story office building will occupy the entire block face along Park Avenue between Stout and California. The property is conveniently located near public transportation and is adjacent to a number of United Way partner agencies. The building design has been composed to relate to the scale, massing and proportions of the neighborhood, employing stepped forms and variations in height to respond to the heights and proportions of adjoining historic properties. On the inside, the space is designed to encourage communication and collaboration among staff of various departments. In the main lobby, a series of displays provide insight into Mile High United Way’s mission, values, and strategic objectives. A complex of meeting rooms and event spaces is situated on the first floor, reinforcing the agency’s role as a convener and leader in the local community.